36 inch heavy and extra heavy sledge hammer hickory replacement handle for 18 to 24 pound heads. Bent manure &amp; barley fork handle. 1-7/16&quot; diameter, 1/2&quot; bore, 8&quot; ferrule. Selected American ash &amp; other hardwoods- with a clear finish. Provides excellent service &amp; value. This 60 inch pushbroom handle is made of selected American Ash which provides the strenght and the elasticity needed for the stress these tool must endure. It comes with a 3/4 inch metal threaded tip. 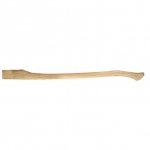 36 inch hickory single bit curved replacement axe handle for 3 to 5 pound axes. 36 inch straight single bit maul handle with eye head 2-5/16x13/16. 36 inch length for 6 to 16 Lb. sledges and mauls. Fire finished, lacquered. Snath, steel web, iron loop bolt, for grass weeds and light brush. Hardwood material.